Gift-giving is a creative process that requires a lot of inspiration and work. Instead of spending your pre-Christmas days running around over-crowded stores check out this Healthy Living Pilates and Wellness Gift Guide to find a perfect gift for *almost* everybody on your list. 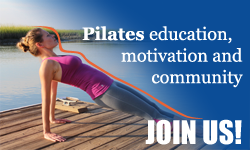 Whether you are looking for fun gifts for your Pilates students, teacher-colleagues, friends or family you will find something fun and unexpected in this guide. use this guide to make your gift-giving fun and creative, not boring and exhausting.